For many reasons, you want to transfer contacts from your Google Nexus phone to computer for backup, in case of the situations that you may lose your crucial contacts on the phone. After all, phone data can be lost easily with unexpected reasons, such as accidental deletion, system corruption, device formatting or factory resetting. If you have ever made a backup, you can get back lost files directly by restoring the backup library. To save your Nexus phone contacts on computer, you need to find a professional third-party Google Nexus data transfer tool to help you. 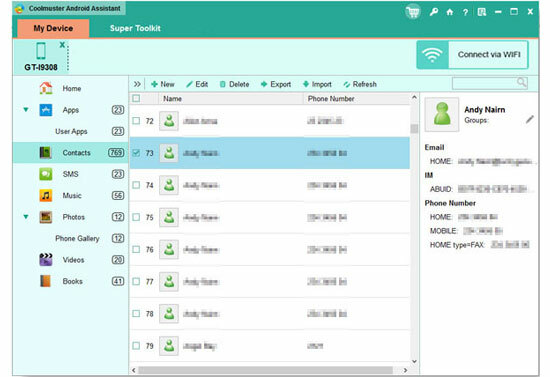 Here we will recommend the best choice that is called Coolmuster Android Assistant, which is specially designed for you to transfer contacts, including all the contact information preserved, including phone numbers, job titles, company names, email address, etc. to computer and save them as HTML file. Android Assistant is regarded as a full-featured Android managing tool to transfer and manage SMS, photos, videos, music, apps and more from Android device on computer. We now offer you free trial version to have a try, you can download it for free from the buttons as below. How to Export Google Nexus Contacts to HTML? In the first step, you should connect your Google Nexus phone to your PC via a USB cable. Install and open the Coolmuster Android Assistant and it will detect your Nexus phone automatically. At the same time, the program will scan your Google Nexus and display all the scanned out files on the left side column in different folders. Just choose the folder named "Contacts" and preview all the contact information on the right. Finally, you can select the contacts you want to transfer by ticking off the checkbox in front of them. If you want to transfer all, you can check the box in front of "Name". After that, press the button of "Export" on the top menu, choose HTML as output format and then the transfer process will begin at once. Just view and check the transferred HTML file in the output location on your computer as you like.